In March of 2015 a newspaper article caught my eye online because it involved the disappearance of a couple in Leicester, N.C., which is near my hometown of Asheville. Cristie Codd and her husband J.T., who had only recently moved to the area, had gone missing from their home and no one could locate them. The disappearance made national headlines because Cristie, a celebrity chef, had starred on a season of the reality show “Food Network Star” and also made her living catering on film and TV sets. She met her husband, J.T., when the two both worked on the crew of the CBS show “Without a Trace.” The two were expecting their first child and had wanted to raise their family in the quiet and serene mountains of Asheville. I kept track of the case for several days until a suspect’s name caught my eye—because I had heard it before connected to another disappearance in the Asheville area. 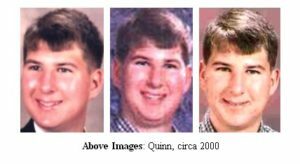 Jason Owens had been questioned when Zebb Quinn, 18, went missing in January of 2000. But more in that later in this post. A few days after the Codds’ disappearance, police picked up Owens, who had worked as a handyman for the Codds, after receiving reports from a local a resident grew suspicious of Owens throwing a large bags of items in a private dumpster. Upon examining the items, police discovered they belonged to Cristie Codd. When presented with the evidence, Owens claimed he had accidentally run over Cristie as he was trying to get his truck out of a ditch. However, this doesn’t explain the death of her husband. By the time police were able to get to Owens’ home and property, where they found charred remains of the couple in a wood stove, most evidence had all but been destroyed. Owens eventually pleaded guilty to three counts of second-degree murder and two counts of dismembering remains. He will serve a minimum of almost sixty years in prison for the crime. Several years ago I watched an episode of Investigation Discovery’s show “Disappeared” that focused on Quinn. I immediately suspected his co-worker Jason Owens, because he told conflicting stories about the last night anyone saw Quinn. Quinn seemed like a nice guy who was probably too quick to trust people. Because he was interested in buying a new car, it sounds like Quinn had some cash on him when he went to peruse some used car lots after work. Guess who went with him? Jason Owens. The two were caught on a video camera at a local convenience store buying sodas after they left work at Wal-Mart. Owens told police the two boys had taken separate cars on that errand, and that Zebb had received a page and made a call from a pay phone that upset him, prompting him to leave early. Supposedly when he sped away, he rear-ended Owens’ truck. What’s interesting is that hours later, Owens received treatment at a local hospital for fractured ribs and a head injury he told doctors happened in a second accident, one that he never filed an accident report for. Quinn’s car was found a few days later in a local restaurant parking lot, with the lights on and a puppy inside. Using red lipstick, someone had also drawn a pair of red lips on the back windshield. This reappearance of his car has never been explained. After hearing Owens’ name come up in the Cristie and J.T. Codd case, my heart sank. I’ve suspected all along that Quinn was dead, and that he probably died the night of Jan. 2, 2000. My guess is that Owens tried to rob Quinn of the cash he had saved up and the two boys fought, or had an altercation that involved their cars. In March and May of 2015, investigators searched Owens’ property and a portion of a national forest in Asheville searching for evidence of Quinn’s remains. I haven’t heard anything about the results of those investigations, but Owens was indicted in the murder of Quinn in July of this year. I hope Quinn’s family can find the closure they’ve been looking for, because this may be all that they ever get. I believe Owens is a coward and a thief who will probably never tell the truth about what happened to the Codds or Quinn. He likely robbed Quinn and my guess is that he was stealing from the Codds and they confronted him about it shortly before their deaths. I only wish investigators had been able to charge Owens for Quinn’s murder before another innocent family had to die.